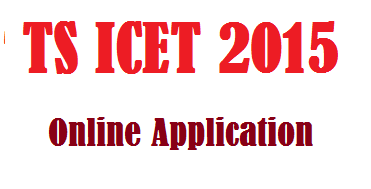 TSICET 2016 Online Application is available to Apply Online for Telangana State Integrated Common Entrance Test (TSICET) for admission into M.B.A. and M.C.A. courses of all the Universities in Telangana State and their affiliated colleges. This test is being conducted by Kakatiya University, Warangal on behalf of Telangana State Council of Higher Education, Hyderabad. Kakatiya University. Procedure to apply for TSICET 2016 Online Application - On your Internet Browser (preferably Internet Explorer version 6.0 and above) type the website address www.tsicet.org, press ENTER button and you will see the following screen displayed on the computer screen. Click on the “APPLY ONLINE” field as shown encircled below. The following “Registration Fee Payment Procedure” Web Page will appear on the screen. In the above page, select the appropriate Registration Fee payment mode (AP Online / e-Seva/ Mee Seva or Debit / Credit card). If the selected payment mode selected is AP Online / e-Seva / Mee Seva follow the instructions given in the screenshot above of the “Registration Fee Payment Procedure” web page. Keep all the mandatory details ready required for filling in the Online Application form along with the Transaction Id. and click on the encircled “Click here if paid through AP Online / e-Seva/Mee Seva” button below. After clicking the above button, the following “Payment Verification” web page will appear. Fill in all the details in the respective fields and Click on the encircled button “Proceed to Online Application form filling”. For example, refer the “Payment Verification” page with the details entered After clicking the above button is clicked, it will proceed to the Step 7 where the Online Application Form will be displayed on the screen. Ignore Step 6 as it belongs to Debit card / Credit card payment mode. If the payment selected mode is Debit card / Credit card, follow the instructions given in the above screenshot of the Registration Fee Payment Procedure web page and Click on the encircled box below. If the selected payment mode is through the DEBIT / CREDIT CARD (PAYMENT GATE WAY) the control will be navigated to the PAYMENT GATEWAY, for payment purpose. Once the payment is completed, the candidate will be automatically redirected to the www.tsicet.org page to complete the Online Application Form with the required details. (NOTE: During the Payment process, DO NOT click on Back / Refresh buttons or DO NOT close the Browser page abruptly.). The following pages will be displayed during the Registration Fee Payment through Debit / Credit card and proceed to the ONLINE APPLICATION FORM. Select Proceed to Pay the Fee Through Payment Gateway Using Credit Card/Debit Card. If already fee paid using Credit Card / Debit Card then select Proceed to Verify and fill Application form if already paid through Credit Card / Debit Card. Payment Through Credit Card / Debit Card page. After entering the correct and mandatory details in the given below in the page of Payment Through Credit card / Debit card page given below, select the card type (VISA or MasterCard or Maestro) mentioned on the card and click the encircled button Make Payment. Be ready with the Card related details (Card number, Expiry date / From date, Security Code / CVVnumber etc). The control will take you to the BANK page (eg: Citi Bank). Select the relevant card logo, it will proceed to the next page. Enter the relevant details like Card Number, Expiry Date & Security Code and click the encircled button PAY NOW. (NOTE: During the Payment process, DO NOT click on Back / Refresh buttons or DO NOT close the Browser page abruptly, instead maintain patience as prompted on the screen). Depending on the user Credit/Debit Card related Bank Site displays the Authentication Page, Select One of the authentication option which applicable to you (ex:OTP). After providing the correct OTP/IPIN the page redirected to Authentication Process. On Correct Authentication your transaction will successful. The confirmation of successful payment of Registration Fee is shown with the “Transaction is successful” item in the below page “Payment Status”. Click on the encircled button “Proceed to Online Application Form Filling” and you will be taken to the next page. Any change whatsoever including that of Caste/Community/Status of category and regional centre claimed in the Online application form will not be permitted once the form is registered with the Convener. As per G.O.Ms. No. 58 Social Welfare Dept., Govt. of A.P. Dt. 12.5.1998, the candidates claiming admission into this course under reserved quota meant for SC, ST and BC are required to produce Integrated Community Certificate issued by the competent authority. Choose the radio button Male or Female for Gender. Enter the Identification Marks. Item No. 2: Qualifying Examination. For example, Qualifying Examination is B.Sc, Passed and Year of Passing is 1997, Hall Ticket. No of Qualifying Exam is BS97A25164 Percentage of Marks is 65.00%, Place of Study of Degree is is Rural. Item No. 3: Choice of Regional Center of Entrance Test. For example, Choice of Regional Center for Entrance Test is Hyderabad then select the Center from dropdown box. * Non Local : As per the Non Local conditions mentioned in the Instruction booklet. * Enter the Hall Ticket No. Item No.7: Non-Minority / Minority: Select the Non-Minority, if you do not belong to the Minority community. Otherwise, if you belong to a Minority community, then select the Minority radio button and using the drop down box, select the relevant Minority community you belong to. For example, your option is Non-Minority as shown below: Item No. 8: Special Category: If you belong to the Special Category mentioned in the categories given, select the corresponding radio button. Provide the House No. or C/o. ; Village / Street / Locality; Mandal / Town / City; District; State, Pin Code; Contact Telephone Number (Mobile); Telephone Number (Landline) and Email. For example, your address is House No. / C/o., 7-3-228/678 , Village / Street / Locality is AMEERPET Mandal / Town / City is PANJAGUTTA, District is Hyderabad, State is Andhra Pradesh, Pin Code: 500082, Contact Telephone Number (Mobile): 9247045045, Telephone Number (Landline): 0840 23830030 and Email is goutham@xyzmail.com, refer the image shown. Item No.11: Intermediate /Degree If you studied Mathematic in 10+2 or Degreen then select Yes otherwise No. Select Place of Study. Item No.12: Photo & Signature. You have to click button “Select file” to upload the photograph file. The photograph file should be in the .jpg file format and the size should be less than 30 KB. To upload the Signature Press the button “Select file” and ensure that the Signature’s file format should be .jpg format and the size has to be less than 15 KB. For example, photo and signature can be uploaded by clicking on the encircled buttons of “Select file” as shown below. Later, browse for the photo and signature files available on your computer system of prescribed file sizes respectively. After furnishing ALL the required data and correct particulars, verify thoroughly the details and go through the Declaration at the end of the page. Select the check box encircled against – “I accept the Terms & Conditions” if you are done with Online Application Form filling. Then, press the encircled Submit button to proceed to the next page.In case you have not completed the application form, red flag alerts on each field will flash (as shown below), which need to be properly completed. If all the details are furnished, then the screen will change to the next page after the Submit button is pressed.